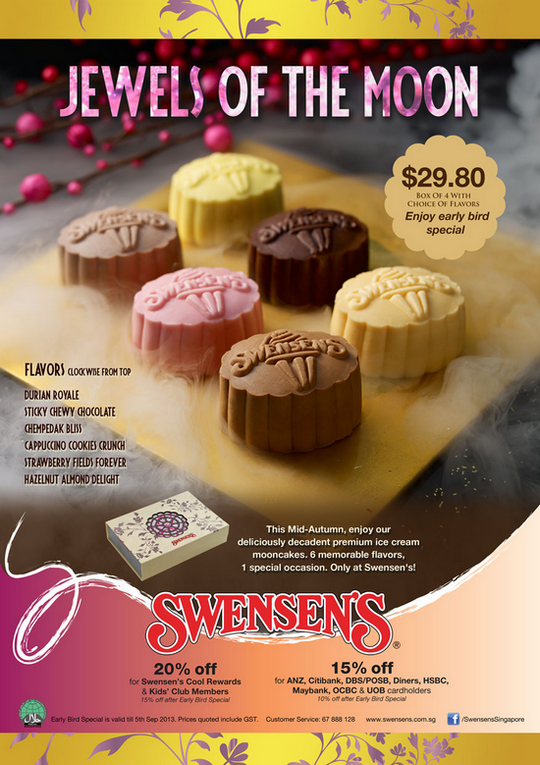 Swensen’s introduces six delectable ice cream moon cake flavours. Hailed as the Jewels of the Moon, the collection showcases new bold flavours Chempedak Bliss, Hazelnut Almond Delight, Cappuccino Cookies Crunch along with all-time-favorites Durian Royale, Sticky Chewy Chocolate and Strawberry Fields Forever. Priced at only $29.80 for a box of 4. Available from 1 August 2013 to 19 September 2013 at all Swensen’s and Earle Swensen’s outlets.